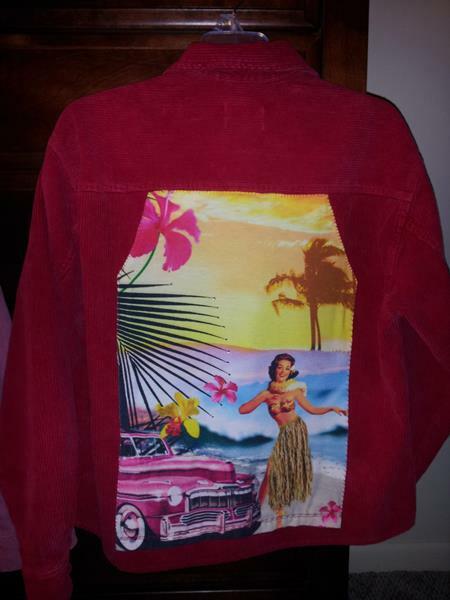 I recently caught the sewing bug and this is what came of it:Jacket + t-shirt + unique decorations = jaquito!I scour the thrift stores for high-quality jackets and interesting t-shirt designs. I wash the items thoroughly, then sew the t-shirt design onto the jacket, and add unique embellishments like patches and custom buttons. Here’s a favorite of mine: a red corduroy blazer with sparkly rock star motif on the back. Custom openwork star buttons on front and cuffs. This jaquito is made of lovely, soft brown corduroy. Flower embroidery on the yoke complements the carefree bicycle image. Spanish text. Butterfly applique on front pocket. 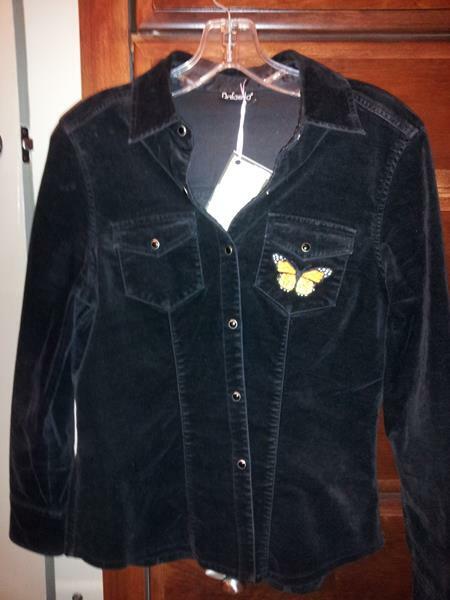 This is a black velvet overshirt with snap buttons. New York City music festival graphic on the back (the roses are sparkly! ); butterfly applique on front pocket. Do you dream of a Hawaiian vacation? You’ll enjoy this vintage image on the back. Tattoo art blue bird on the front pocket. Red corduroy, zips closed. SOLD. I love tattoo art. Here’s a classic look: jeans jacket, with colorful rainbow wings and “love” heart on the back. Red rose applique on the sleeve. SOLD. Finally, this pink overshirt has rose tattoo art inside AND out. Pink rose patch on the sleeve. Flower buttons on front pockets. All these are medium-sized and priced at $35. Please leave a comment if you're interested in buying one, or in a custom order! Merci!